Hello everyone, are you ready for some more punchy goodness? My niece and daughter were born just a few days apart, so she will also be turning 4. 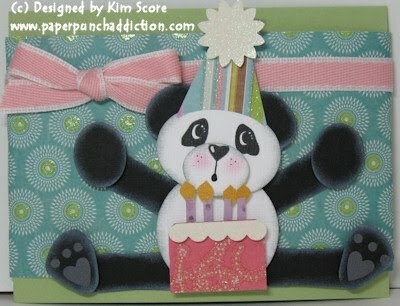 I made this pop up gift card holder with a cute punch art panda on the front. The tutorial for the bear and pop up card is detailed below. Want to dress up your cute little punch art bear? 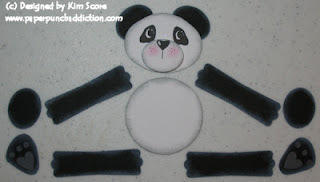 Check out my Bear for All Seasons & Build a Bear punch art classes for many outfits and costumes. 1) Cut butterfly in half and bottom of wings off to create feet (as shown). Round out sharp corners on feet pieces. 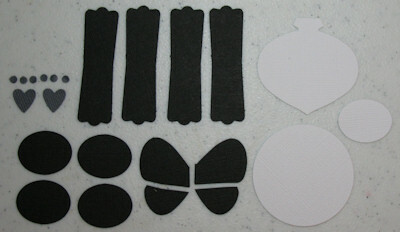 Lightly sponge the edges of the black pieces with craft white ink. 2) Cut the top off the ornament and round out the pointy bottom. Lightly sponge the edges of the white pieces with basic gray ink. Stamp the face with black onto the ornament using the Peachy Keen Tear Bear Face Parts stamp set (panda face). Stamp the nose and mouth parts onto the white medium oval. Use a fine line zig pen to draw a little circle "o" mouth onto the muzzle. Use a sponge and pretty in pink chalks to add some blush to the cheeks. 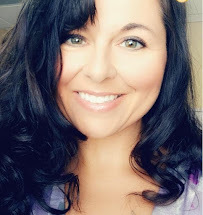 With this face set, you don't even have to add any white highlights to the eyes and nose. Attach the muzzle to the face with a dimensional (line up the muzzle over the stamped nose on the ornament). 3) Glue ears onto back of head. Attach head to body with dimensional. Attach arms onto back of body with dimensionals. Attach paws with dimensionals. 4) For feet, glue smallest heart onto foot pad. 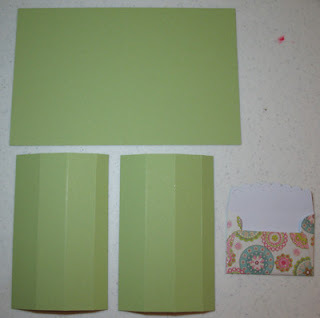 Use the crop-a-dile to punch the smallest circles out of basic gray cardstock and glue on toe pads. Attach legs to body with dimensionals. Attach feet to legs with dimensionals. 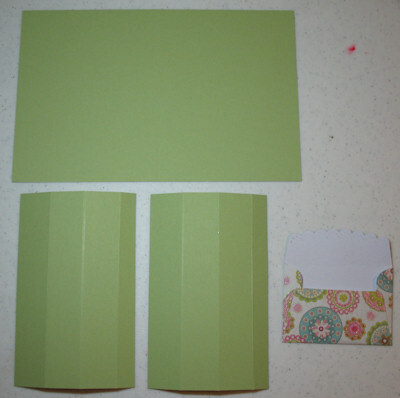 2 pieces cut at 5 1/2" x 3 1/2", on both pieces, score along the short side at 1", 2" & 3"
Die cut the scallop envelope using the Stampin' Up! Sizzix die. If you don't have this die, you can make an envelope the size of the gift card, or simply use the little envelope the gift card comes in. Glue the sides in place on the scallop envelope. 1) Apply scor tape along the 1" score line on one of the pop up pieces. 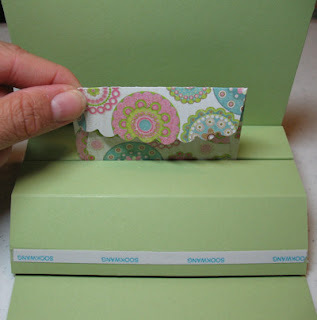 Attach to the inside of the card base with the edge of the pop up piece lined up with the center crease of the card. Apply scor tape along the 3" score line. 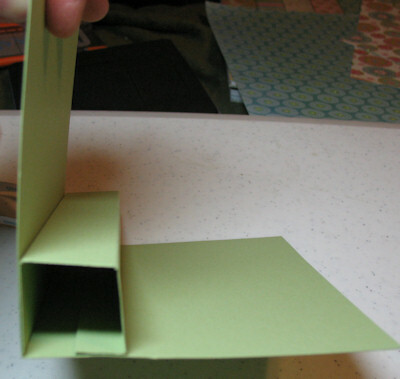 Holding card base at a 90 degree angle, adhere the pop up piece onto the inside of the card. It should form a little "chair" on the inside of the card. Make sure the card closes flat before securing the score tape in place. 2) Attach the little gift card envelop to the front of the "chair" as shown. 3) Apply scor tape along the 1" score line on the other pop up piece. Adhere to the front of the pop up piece, covering the bottom front of the little envelope. 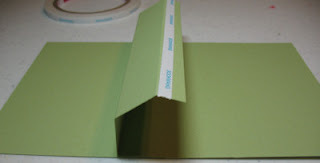 Apply scor tape along 3" score line and adhere to inside of card, the same as before. Make sure that the card is closing flat when adhering the pop up piece. 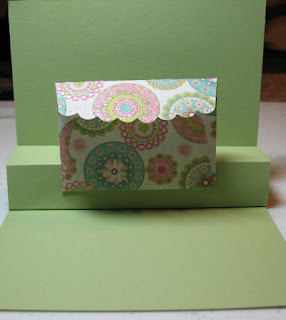 4) Decorate inside of card. 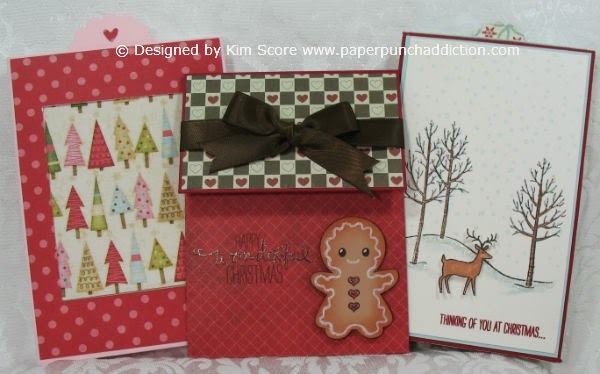 I stamped the greeting from Well Scripted stamp set and punched out with wide oval and mounted onto Decorative Label. Tie the 1/8" pink taffeta ribbon around the little envelope to keep the flap closed. The designer papers I used are from My Minds Eye and it's called Deena's Penny Lane. The paper is so much prettier in person because it has glitter all over it. Cut a 12" x 3 1/2" belly band to wrap around the outside of the card to keep it closed. Tie the poly twill blushing bride ribbon around the outside belly band and mount the panda with dimensionals on the belly band. OH Kim!! 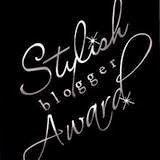 This is so flippin adorable!! 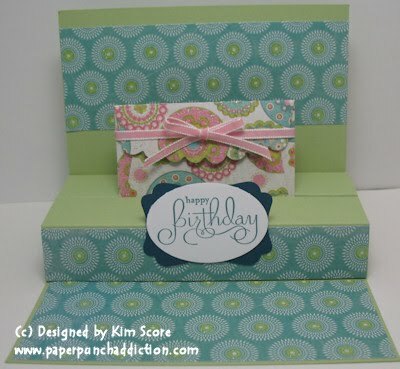 Beautiful card... love all your creations and tku for sharing it! 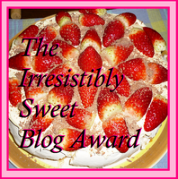 thanks Kim - this is soooo cute! I love pandas ... this one will be used a lot! How cute! Love your panda and the pop up tutorial... thanks for sharing! 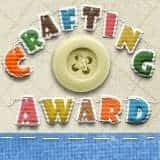 Your paper piecing is awesome!